Before delving deep into the topic as to why there is such a rise In demand for slip ring assembly having a large diameter? Let's just understand what is a slip ring assembly? Basically, a slip ring assembly helps to establish connections between the sensors available in the rotating part of the equipment to the data acquisition source. The list of sensors includes thermocouple, strain gauges, accelerometer and other such sensors. The premise for the use of slip ring assembly is based on the idea that during the rotating motion of the equipment, it becomes imperative to form a connection which would allow the sensors to simultaneously rotate with the equipment without hindering the data acquisition process. A slip ring assembly has two important parts called the stator and the rotor. The rotor is attached to the rotating structure of the device, for instance, a shaft, they further are connected to the sensors. Following the normal convention of a slip ring, the signal procured from the sensors are transmitted from the rotating components to the stator. The stationary part further is attached with a DAQ. In a nutshell, the slip ring assembly makes way for the rotating signals to a stationary collection source. With the unparalleled development in technology, the industrial machinery, and other manufacturing processes have become a lot more sophisticated and multifaceted. Modern day equipment like the ones used for treating wastewater, handling a huge amount of materials, testing equipment, and pedestal cranes. Every industrial machinery is equipped with a slip ring, it allows the transfer of electric current and signals from the stator to the rotor and vice versa. It is to be noted that such equipment operates under harsh working conditions. Hence, they require regular maintenance, which makes it highly cost ineffective. Also, the price of such machinery in itself is huge. Hence, proper maintenance becomes imperative as the firms can't replace the equipment at their whims. 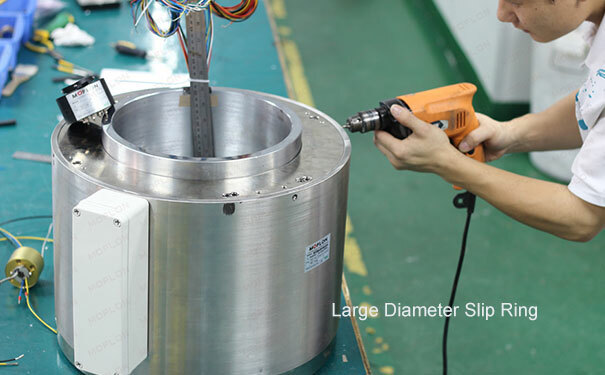 Owing to the large size of the equipment itself they require a huge diameter slip ring assembly to make the installation process smoother along with a through bore at passing through the center. This reduces the frequent need for maintenance, which further makes the system cost-effective. There are various slip ring manufacturers who have come up with through bore slip ring for high-end equipment, such as firefighting vehicles and port machinery. Generally, most of the large diameter slip rings are laden with a 120 inch through bore. 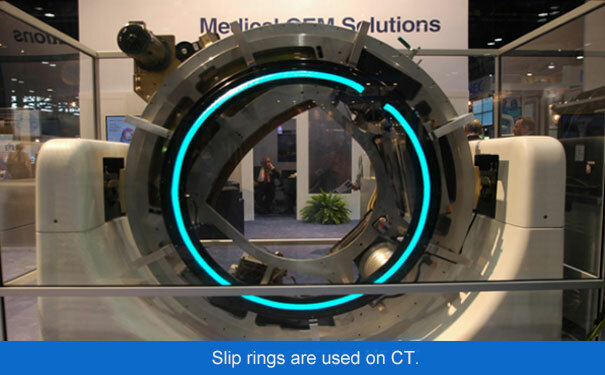 In medical fields equipment such as CT scanners operate best with the use of large diameter slip rings. The reason behind it is that with the use of such a slip ring, it can garner a high-speed transmission of data with a rate of just under 300 rpm.